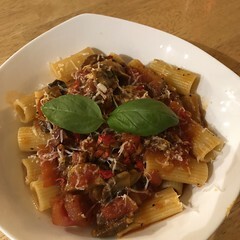 This is an alternative way of preparing a basic tomato sauce featuring Cremini mushrooms, preferably using fresh and ripe tomatoes. You can use canned tomatoes in the off seasons. This particular method is slightly different from our previously released Tomato Sauce with Mushrooms recipe. 24+ ripe plum tomato (romanello or san marzano) or a 28 oz. can San Marzano tomatoes (hand crushed). 1. Rinse and peel the tomatoes and remove the stem and hard bits (pedical and sepal). 2. Cut into small pieces, place in large bowl, roughly squeeze and crush by hand. 1. In a large dutch oven, fry the pancetta in about 2-3 tbsp olive oil until golden brown. 2. Add the onions, garlic, and optional peperoncino (hot pepper flakes). 3. Once the onions show signs of transparency and the garlic begins to soften add a cup of white wine. 6. After about 5 minutes or so add the tomato paste, mix well and let it simmer. 7. After about 10-15 minutes, as the tomatoes break down add the sliced cremini mushrooms, mix well. 8. As the mushrooms begin to soften add a cup of water and the bay leaves along with some salt and pepper. 9. After about 10 minutes or so, add the fresh basil and the juice from 1/2 lemon. 10. As the sauce cooks, taste frequently, add salt and pepper to taste, let simmer for at least 30 minutes or more! 11. Top with fresh grated Pecorino Romano, Parmegiano or Ricotta Salata.